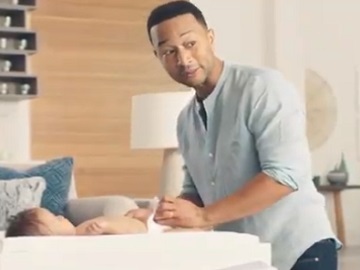 Pampers has released a teaser for its Super Bowl LIII commercial, starring John Legend. Titled “Stinky Booty Duty 2.0,” the spot aims to celebrate the special bond dads have with their babies and will feature, according to the brand, surprise guests. The teaser shows the singer discovering that his baby boy has a stinky booty and realizing he’s going to need some backup on that one. When his daughter hands him a Pampers baby wipe, he turns around and calls for help, saying “Guys…”. A final onscreen line reads “Changing the Game 2.3.19”. This is not the first time the award-winning musician collaborates with Pampers. Last year, for Father’s Day, he and the brand released a video of the “stinky booty” song that he sings to his daughter, Luna, while changing her diaper. His wife, Chrissy Teigen, officially joined the Pampers family in March 2018 as the Creative Consultant for Pampers Pure collection, which includes diapers and wipes showcased in the teaser for this year’s Big Game ad. Legend is the latest name to join a growing roster of celebrities starring in commercials for this year’s Super Bowl. Sarah Michelle Gellar stars in Olay’s ad, Ilana Glazer and Abbi Jacobson (creators of and actresses starring in the Comedy Central series “Broad City”), Harrison Ford, Forest Whitaker, and twin astronauts Scott and Mark Kelly star in Amazon’s Super Bowl commercial. Former NFL star Terrell Owens appears as the star of a segment called “Super Bowl Party Prep With Terrell Owens” in the spot for Febreze, Maluma and Zoë Kravitz star in (separate) ads for Michelob ULTRA, Kristin Chenoweth teaches a trio of dogs how to sing the tune of Avocados from Mexico, and Christina Applegate unwillingly plays an annoying game in a grocery store parking lot in M&M’s teaser for its Super Bowl LIII commercial. However, the list is even longer, with more famous names tapped by brands to pitch their products.